Win a Manchester United shirt with Betfair! Manchester United are currently sitting second in the Premier League and in the semi-finals of this season’s FA Cup. Arguably the biggest and most-supported football club in the world, they are also the most successful in England, with 20 top flight titles. A number of world class stars have played for the club over the years – including Cristiano Ronaldo, George Best and David Beckham. The current crop of players will be looking to emulate their peers in the coming seasons as Jose Mourinho’s side look to compete for the top trophies – with the Premier League and Champions League being the most sought-after. This season United will be disappointed to have been eliminated from the Champions League by Sevilla, and trailing 16 points behind Manchester City in the Premier League. However, the FA Cup is still at stake. And the Betfair football betting odds have United as favourites ahead of next month’s semi-final at Wembley Stadium with Tottenham Hotspur. Chelsea and Southampton make up the final four with the final of the prestigious competition taking place in London’s capital on Saturday 19 May. Prior to the cup final we have teamed up with Betfair to offer our readers the chance to win an authentic Manchester United shirt. 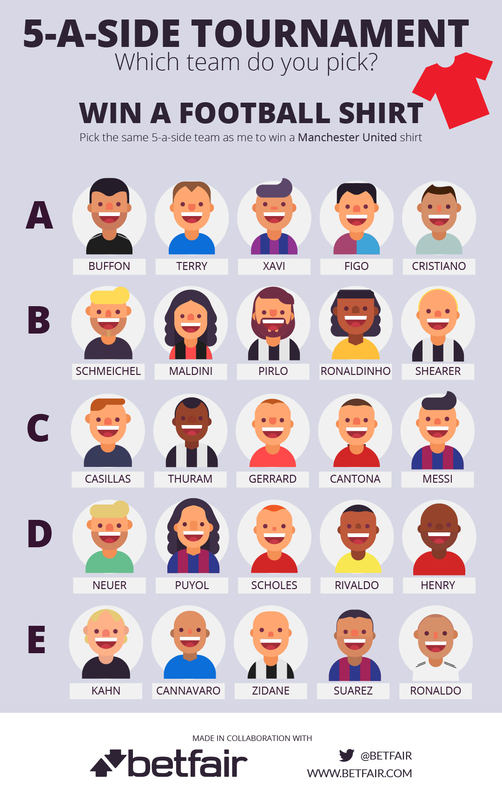 All you have to do is look at the 5-a-side tournament graphic below and pick your favourite team from the five available. If you select the same team as me then you’ll be in the draw to win the shirt! A Ladbroke’s punter has one hell of a success story to tell his mates down the pub this week. 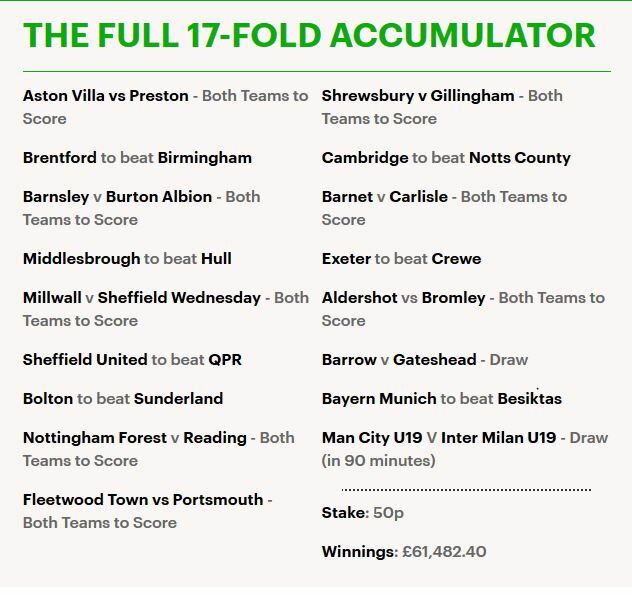 The lucky Manchester man turned water into wine by placing a less than ‘beer money’ bet of just 50p on a seemingly outlandish 17-fold football accumulator. The bet was a mix of match results and both teams to score and covered matched from various leagues. As the saying goes though, you’ve got to be in it to win it and he indeed benefited from that attitude, to the tune of a very healthy £61,000. It’s not everyday you manage to multiply your stake by a mind boggling 122,000 times now is it! As you can imagine, getting 17 results up doesn’t come without a few ‘flying by the seat of your pants’ moments. 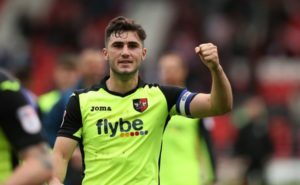 Two sticking point fixtures were threatening to crash the party in the form of Exeter trailing 1-0 at Crewe (the punter needed an Exeter win) and Aldershot 1-0 down to Bromley (where he needed the final result to be a draw). In something of a ‘someones looking out for him’ moment though, the bet came good courtesy of unbelievable 92nd and 95th minutes goals in the Exeter game (thanks to Taylor-Moore and Stockley), as well as a 92nd minute equaliser in the Aldershot match. A Ladbroke’s representative had this to say about this punter’s good fortune: “The amount this punter has won is simply staggering, but the sheer luck involved in this acca is the real story here”. Did you know that Gloucestershire makes over £100,000,000 every year directly as a result of the Cheltenham Festival? Did you also know that The Jockey club has spent close to the same figure over the last 30 years on the facilities at Cheltenham Race Course? Both of these obviously stick out as astounding amounts of money and proves that The Festival is the only race that you NEED to be at. The Supreme Novices Hurdle brings the curtain up on Cheltenham 2018 and punters have a real chance to get off to a flyer with odds compilers seemingly at a loss to nail down the winner. Labaik stole the show last year for Gordon Elliott and Jack Kennedy off a monster 25/1 but there’s no hope of two-in-a-row. Getabird is favourite in the antepost betting across the board, with williamhill.com marking the six-year-old up at 11/8 the weekend before the race. Willie Mullins’ gelding has been a popular pick of those looking to beat the rush and get their money down early, but we’ve seen in past renewals of this contest that being favourite doesn’t always guarantee success. Here are some trends you should know about before sticking your neck on the line….. The jolly has failed to deliver in each of the last two runnings of the Supreme Novices. Labaik’s win was preceded by Altior the year before at 4/1. In fact – and this one is worth sitting down for – only two favourites have won this race 13 renewals, and even one of those was joint-fav, Vautour (2014). That stat alone will be enough to scare shrewd backers off the market leader. Trainer Willie Mullins does have a fearsome reputation in this race and it’ll be a brave punter who opposes him, the star trainer winning three of the last five. He left empty-handed in each of the last two races but did win three on the bounce, Champagne Fever (2013), Vautour (2014) and Douvan (2015). All three victors were short in the betting, with no better than 5/1 the SP. Six has been the magic number in recent times with a six-year-old winning the last two Supreme Novices, and half of the last 10. Will we get a hat-trick and, if so, who’s the runner to deliver it? It remains to be seen if he’ll run in the race, or target another Cheltenham challenge, but Samcro is a six-year-old who is more than capable of carrying the baton. Not only does the age fit but he’s guided by last year’s winning trainer Gordon Elliott and brings a 100% win record from six previous starts. Chalked up as a 6/4 second favourite but there’s few in a rush to write him off. If you prefer to keep your stakes low and take a chance on something at a bigger price you may be interested to learn that the Supreme Novices is no stranger to an upset, giving five winners at double-figure odds in the last decade. Labaik was 25/1 SP last year but, in that period, there has been 2x 10/1 winners and a couple at 12/1. William Hill have one 10/1 shot in the antepost field – Summerville Boy, and one at 12/1 – Mengli Khan.